Whether you own a multimillion company or a small-time start-up, you will need to purchase the things needed for your business to thrive. 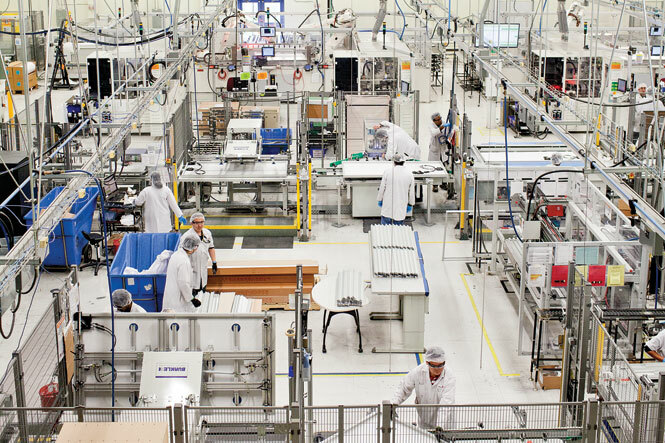 Some industries heavily rely on equipment to successfully execute the type of service or for production of their products and some not so much. Whichever industry or business you may come from, you will have to purchase equipment be it for heavy tasks or not, therefore, you will need some type of agreement in the process of purchasing. There is a need for agreements when doing transactions such as buying equipment for a business or industry; not only because it can help smoothen the flow of the transaction, but mainly because it helps protect the huge amount of money that has been invested. With that in mind, there will always be a probability of procuring equipment that has defects, and to make sure you are able to receive a refund or have the piece replaced, an agreement should raise and state those otherwise you will get nothing in return. As you may know by now, the purpose of an agreement in general is to protect and help enforce the rights of each party involved in the transaction. The agreement secures that the obligations both parties have in the transaction are carried out and when there is conflict, the agreement can also help both parties resolve such issue. There is no difference when it comes to an equipment purchase agreement; the main goal is still to protect both their interests and rights, and to also help them enforce the obligations and responsibilities involved in the transaction. Note: There are other equipment purchase agreements that follow a different format and thus have different contents as well. 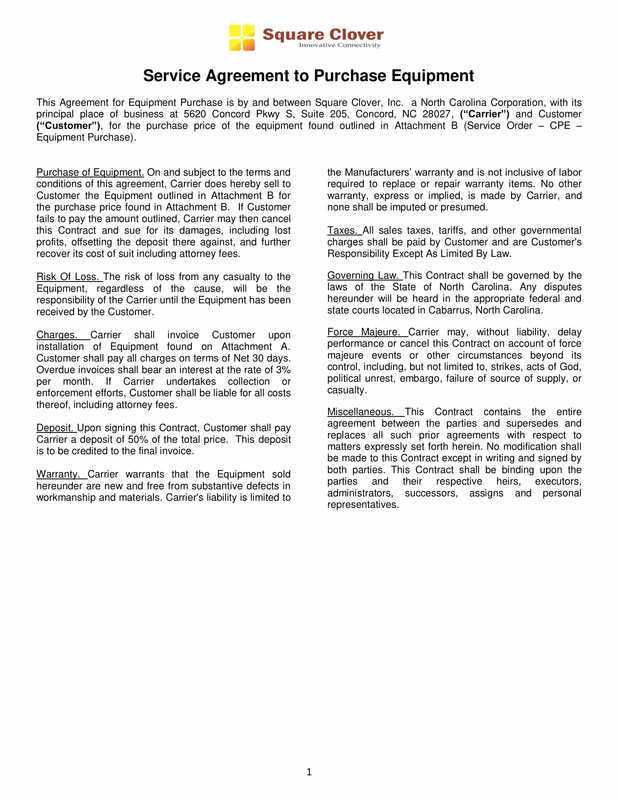 However, these contents are commonly found in all formats of an equipment purchase agreement. 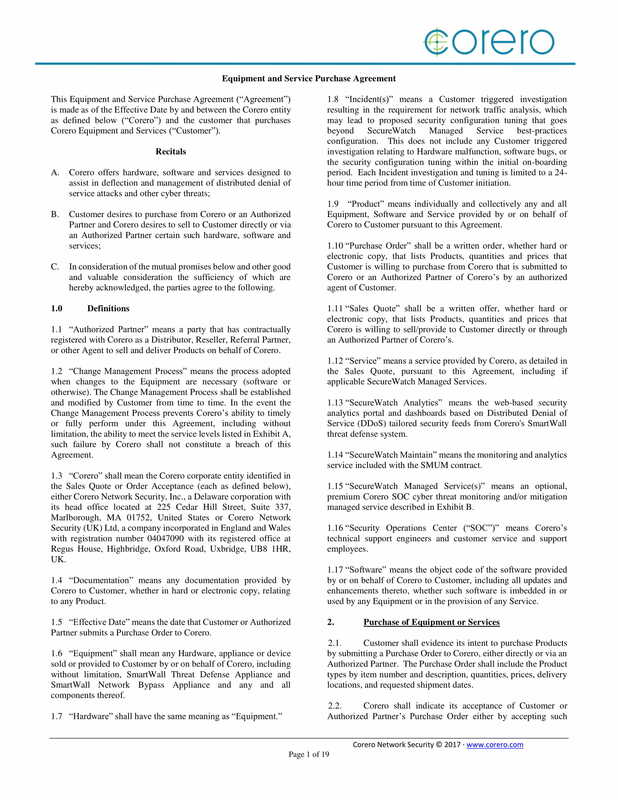 You may skim through the list and find provisions that fit the agreement you are entering to. 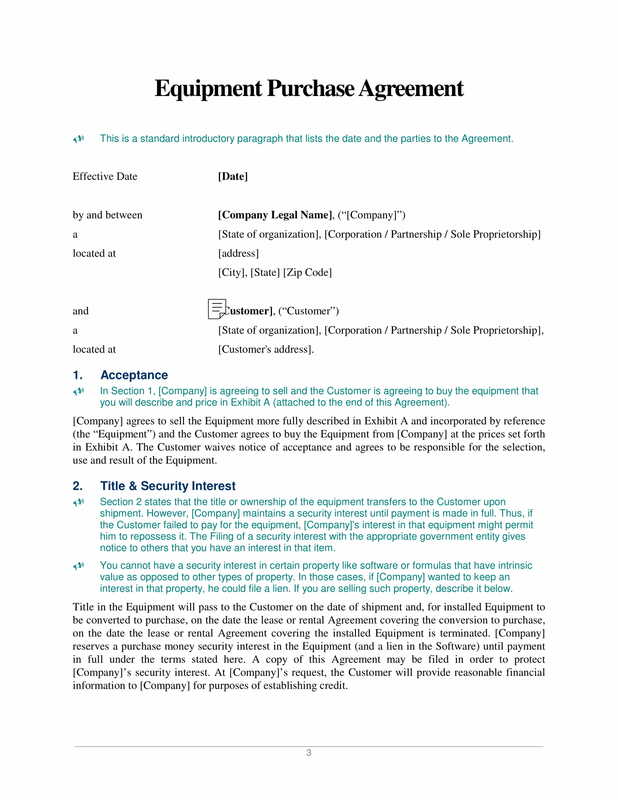 Since you know the contents of an equipment purchase agreement, you should also know how to make one in case you need one in future business transactions. 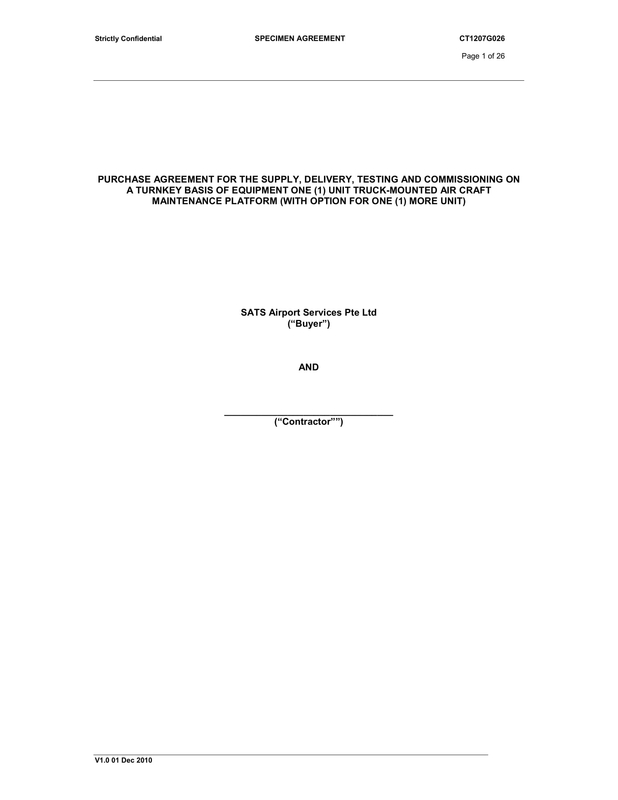 The guide given below are subject to approval or insight of your business or legal attorney’s approval. The date reflected in the agreement should be the exact date the agreement was finalized and signed. It should not be the date when the negotiations were made, but the exact date when both parties have reached a final agreement and have come into terms with regards to the purchase of an equipment. Both parties should be identified individually; it should be specified who is the seller and the buyer to make it clear who provides who to whom and who pays for the purchase. Aside from the names of the individuals or company names, the address, and contact information of both parties should be included. 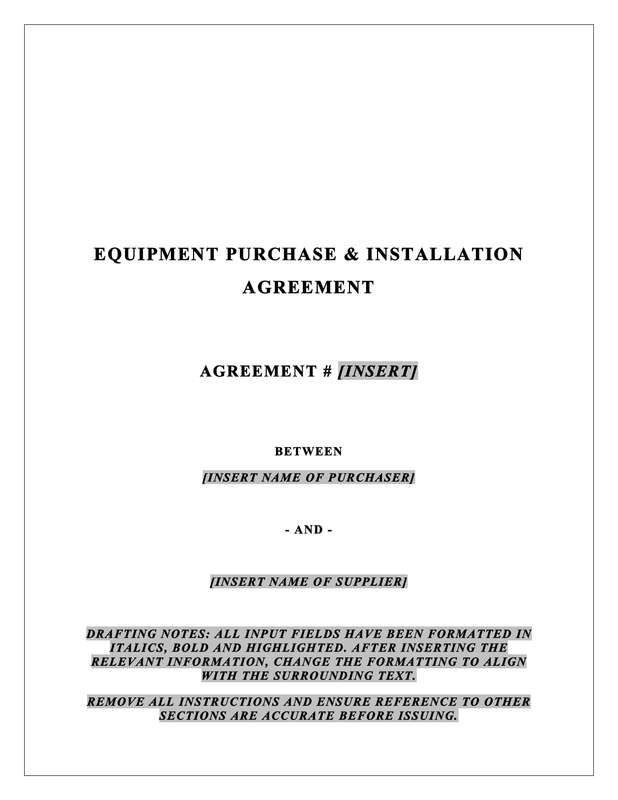 This section states that the title of the equipment is immediately transferred to the customer once the equipment has been successfully shipped. However, it should be emphasized that a company retains security interest until the customer has made its full payment. Therefore, with the security interest, the company may be able to repossess the equipment if the customer is not able to give the full sum for the payment. 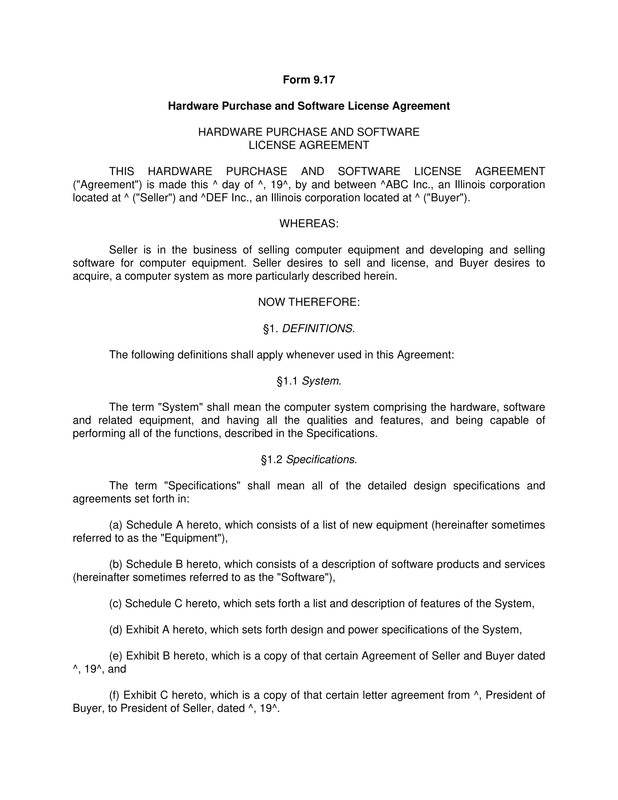 In addition, you cannot enforce a security interest if the property has intrinsic value such as software or formula. It is best to describe the property in the same section. Generally, companies employ F.O.B (free on board), this means the F.O.B. supplier’s warehouse would mean that the customer will shoulder the charges for delivery as well as the damages once the equipment leaves the supplier or company’s warehouse. Therefore, the first part of this section should state the method of delivery that will be used by the company selling the equipment; will it be through F.O.B warehouse or a personal delivery? After that, a description of the carrier to be used should be stated and to be followed by the address where the equipment should be delivered. The installation process is described and discussed in this section. This section should also state that the customer should prepare the installation site and that they should cooperate with the company. In addition, the address where the equipment will be installed should also be included in this section. The training the company will provide in order to operate, troubleshoot, repair, etc., to the customer should be discussed in this section. The location and the duration of the said training should be included. 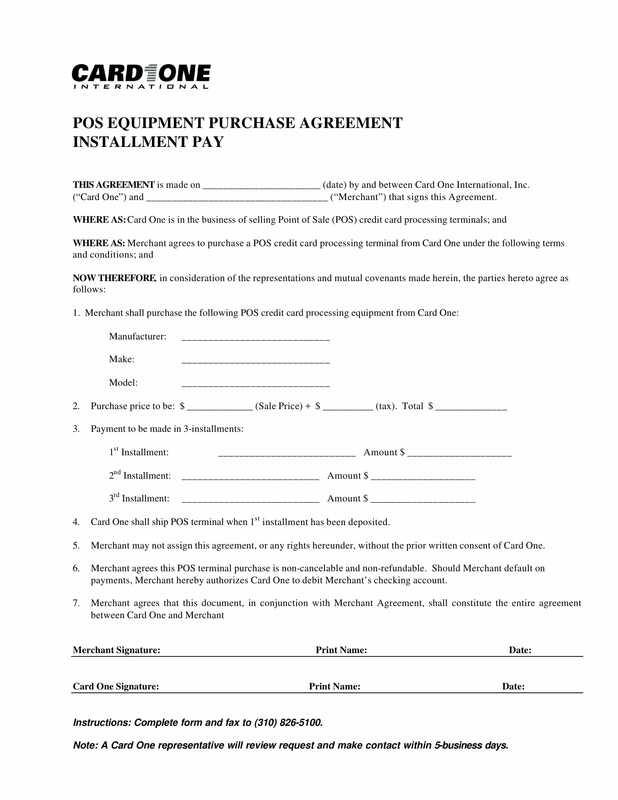 This section of the agreement should discuss the mode of payment to be made by the customer in exchange for the equipment. It should be made clear the type of transaction between both parties involved; it should be clearly stated whether the transaction is cash/credit, or a rental, or lease that converts into sale. This section should state that the customer has agreed to pay the taxes applicable to the purchase of the equipment. Since this agreement should be made after a back-and-forth negotiation, it should be stated how much the customer will pay for taxes incurred in the transaction. This section should clearly describe the standard warranty provisions included in the purchase of the equipment. The inclusions on this section depends on the setup both parties have agreed upon. The exact period or duration for the warranty should be stated. This means the provisions regarding replacement, replace, or refund should be discussed in this section. This subsection should describe the exclusions to the warranty such as repair, maintenance, relocation, etc. This subsection should state that this warranty is the only applicable one and that there are no other warranty that applies or are in effect. 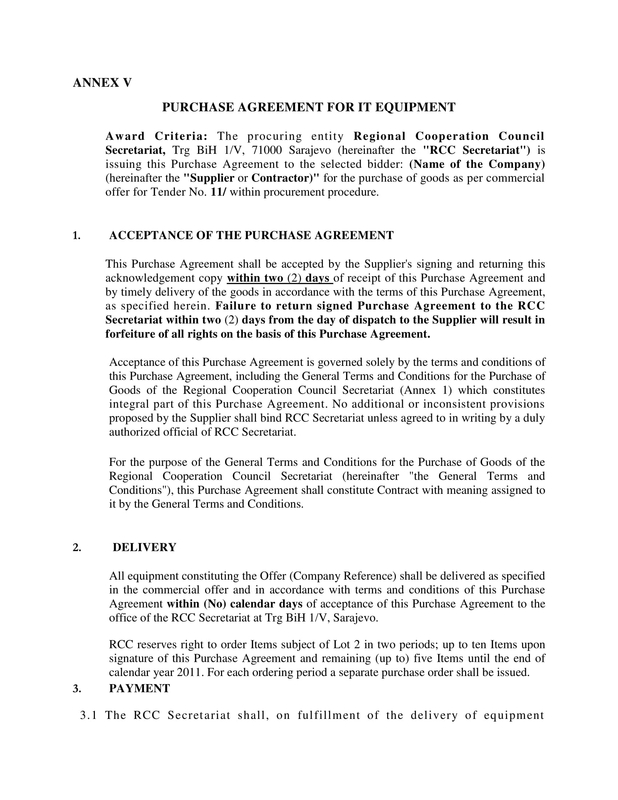 This is the section wherein a clear description of the equipment covered by the equipment purchase agreement is stated. This section, aside form the description made in Exhibit A, should be able to provide a clear mental description of the equipment. This section should state that the customer is brought in as defendant with regards to the patent suits brought by third parties. This subsection should state that the company will pay for the damages should the customers incur any patent infringement suit. This explains the exclusions for the payment for the damages, for example, when the customer uses the equipment in manner in which it was not intended for or modifies the equipment that infringes on the patent. This section discusses the the limitation of the liabilities the company has over the purchased equipment and/or for the customer. It should also discuss that the company is not liable where they cannot do something and that the failure to act is beyond their control. This contains the statute of the limitations both parties should adhere to. This means the period of time after which both parties cannot bring a cause of action against the other. This section should contain the specific amount of time when a cause of action can be brought. The following general provisions are fairly standard and of the same nature form that of other formats of an equipment purchase agreement. Generally, these provisions enhance the balance of the agreement though defining common issues that could possibly arise such as notice, assignment, legal actions, and so on. A statement about both parties having reviewed, understood the agreement should be included. It should also be emphasized that both parties has reached an agreement and has approved the contents of the agreement as the concluding section of the entire agreement. 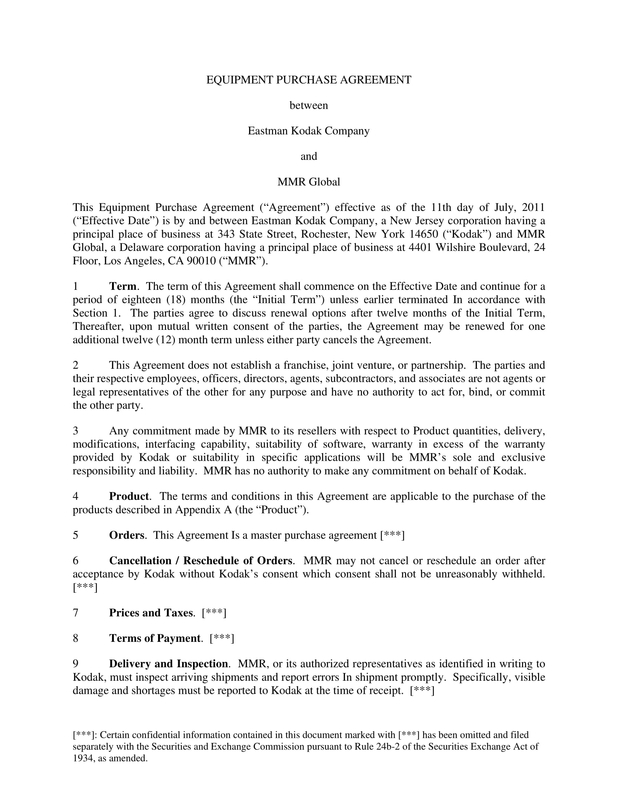 A signature line consisting of the name for representatives for both parties as well the position/designation to the individual businesses or industries that they came from should be included as the final section of this equipment purchase agreement. 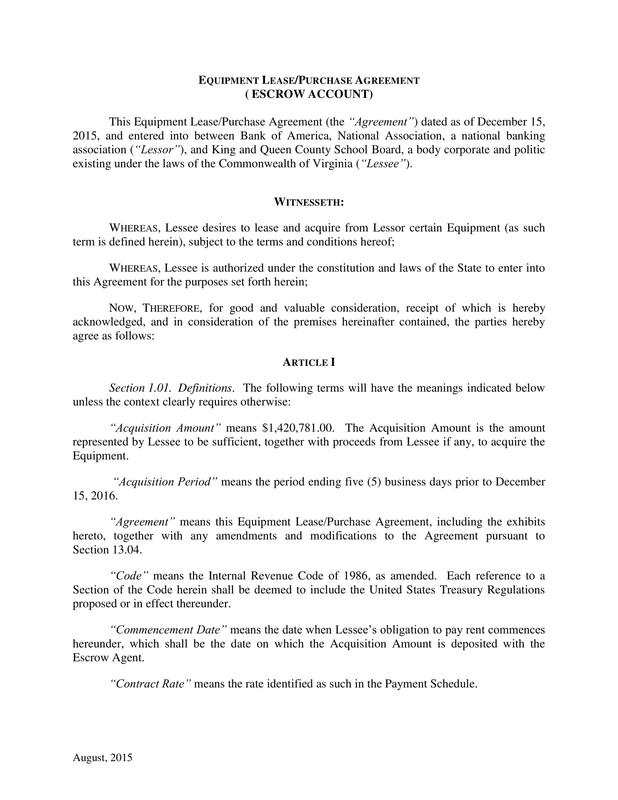 An equipment purchase agreement is an important document you should provide or demand when dealing with the sale or purchase of an equipment. It helps both parties ensure that their rights as supplier/customer are protected and enforced according to what has been agreed and what has been identified as legal. 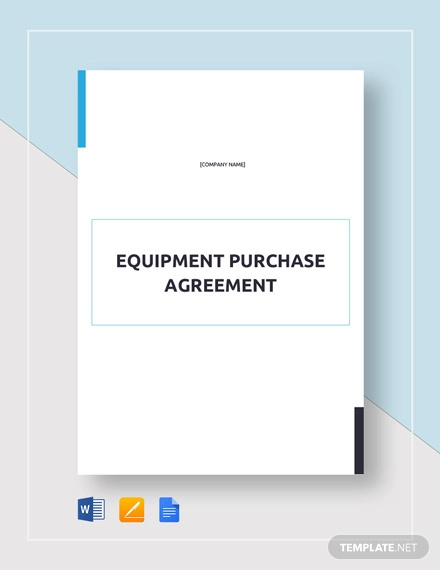 We hope that you have learned something about an equipment purchase agreement with this guide.